I have recently discovered a new baking show which is aired on my local cable network. The show is produced by BBC and is called "Bake" by Rachel Allen. Although it's only a half an hour show, I find her program to be extremely interesting. In the first part of the show, she would whip up a baked recipe and it could be either sweet or savoury. In the mid section of the program, she would cover a short feature. The last one was visiting a local chocolatier and having a quick insight as to how chocolate truffles are made. In the last piece of the program, which is an instructional piece, she would take a group of students through the intricacies of a baked recipe. This particular recipe which I'm posting now comes from one of Rachel Allen's programs. If you are lazy you have the option of purchasing frozen puff pastry which will save you a bit of time. However if you do have time, it's always better to make your own. My other half who is not a "sweet toothed" person, thoroughly enjoyed this. 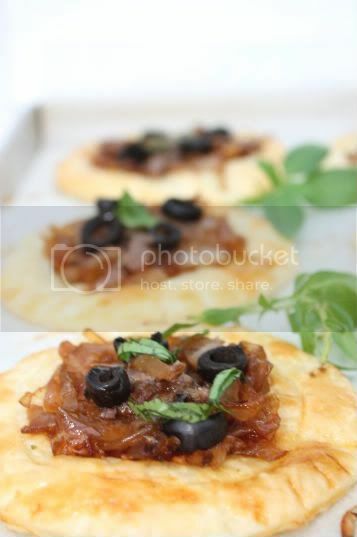 It's amazing how the carmerlized onions blended so well with the saltiness of the anchovies and black olives. One piece of advice would be to make sure you cut each anchovy in half before latticing your pastry, otherwise it may be way too salty! Also make sure you eat this fresh from the oven. Serve with a side salad or just have it for an afternoon treat. Recipe adapted from Rachel Allen's "Bake"
1) Put the flour, butter and a pinch of salt in a food processor and process briefly. 2) Add half the beaten egg and continue to process. (You might add a little more egg, but not too much as the mixture should be just moist enough to come together.) If making the pastry by hand, rub the butter into the flour until it resembles coarse breadcrumbs then, using your hands, add just enough egg to bring it together. 3) With your hands, flatten out the ball of dough until it is about 2cm thick, then wrap it in cling film or place it in a plastic bag and leave in the fridge for at least 30 minutes or, if you are pushed for time, in the freezer for 10–15 minutes, before using. 1) Heat the olive oil in a wide, heavy-bottomed frying pan, then add the onions. Stir the onions and cook over a low heat, covered, for at least 20 minutes, stirring continuously and scraping the base of the pan every few minutes. 2) Add the garlic, herbs and salt, pepper and sugar, and continue cooking for ten minutes, or until the onions begin to melt and turn golden. Remove from the heat. 2) Remove the pastry from the fridge, uncover and, with a floured rolling pin, roll out on a floured work surface into a rectangle to fit a 23 x 33cm swiss roll tin. Lift it onto the tin and prick the whole base with a fork. Bake in the oven for ten minutes, then remove. 3) Cover the pre-baked base with an even layer of onions. 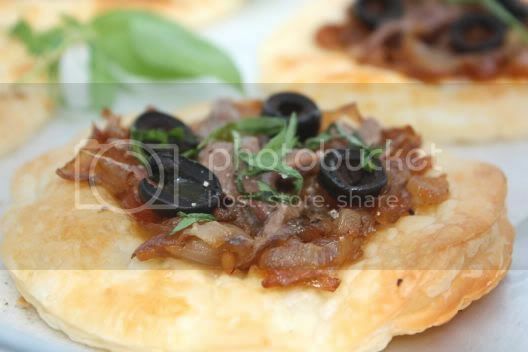 Arrange the anchovy fillets in a lattice pattern over the onions, placing a whole or halved olive within each diamond. 4) Return to the oven and bake for a further 25 minutes to allow the flavours to blend, and the pastry is golden brown and crisp around the edges. Serve hot or slightly warm. 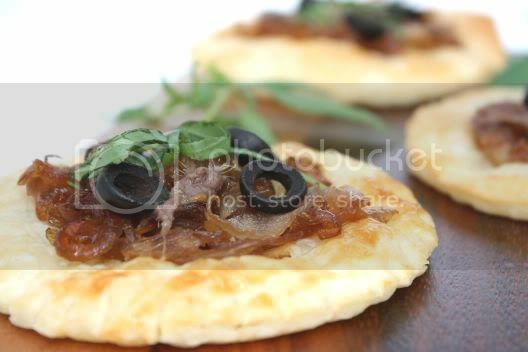 Onion and anchovy, my favourite combination! With puff pastry, it's a winner!! Sounds like an interesting show to check out and pissaladiere looks fabulous! This is a classic French treat. Always good! Carmelized onions are one of those things that are easy, though somewhat time-consuming to make. However, the end of result is heaven in a bite! I can just imagine how the sweet and saltiness combined together. Great looking appetizer! 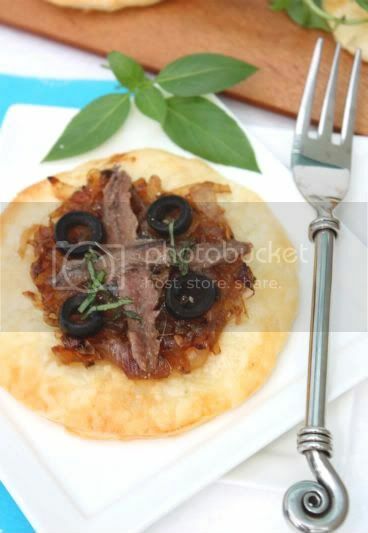 I love pissaladiere! Your minis are so gorgeous, perfect for guests.